What is the technical evidence for a Bull or Bear market? If we keep it simple, the evidence is solidly Bearish. Is this sort of manic-depressive volatility a sign of a healthy Bull market? No, it isn't. Extended periods of wild swings from euphoria and hope to fear and despair typify markets that are about to break down. Equally bearish is the market's inability to climb back above the 50-day moving average, which is declining and offering a solid band of resistance, and MACD's inability to regain the neutral line. Instead, this indicator has turned back down. Without resorting to some very fancy slight-of-hand, is there anything remotely bullish in this chart? Once again, keeping it simple, we notice the uncanny power of the 200-week moving average (MA) to provide key support and resistance. The rally off the March 2009 lows bounced off this line as resistance in May 2010; when it finally surmounted it in late 2010, the market rallied solidly for six months. 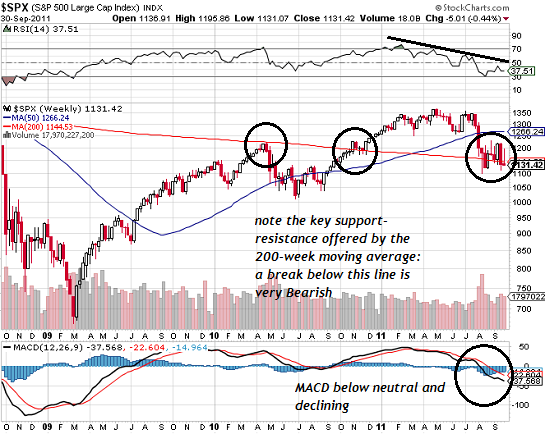 The SPX has already broken through the support offered by the 50-week MA, and is now testing the 200-week level. Back in 2009, the market's break below the critical 200-week MA in the sand and its failure to regain it presaged the slide from 1250 to 670. Also mirroring the 2008 setup is MACD, which is once again solidly below the neutral line and declining. Here's what markets do when they break critical support: they re-test lows. That sets up an eventual target for this decline of 670, which would be a re-test of the March 2009 lows. 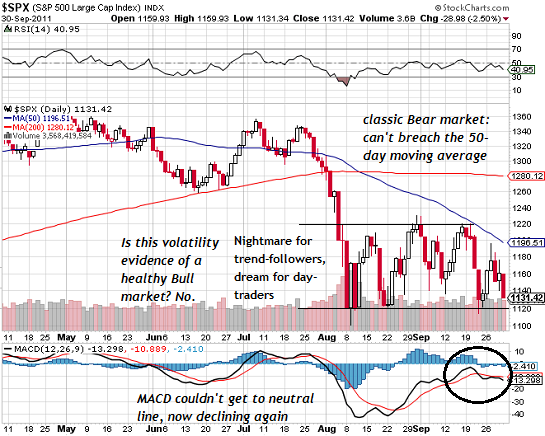 Bulls have to answer this question: once the 200-week MA is broken, why shouldn't this market re-test the recent low? If it's "different this time," what makes it different from every other era and market? This chart suggests an eventual target around 600, even lower than the March 2009 lows. It might be a good time to recall that index funds are only "safe" in the sense that they aggregate the risk of all stocks in the index. A market that declines 40% will take index funds down 40%. There is nothing "safe" about long-equity funds that track a market heading down. Nobody knows what will happen tomorrow, much less 30 days from now or three months from now, but as of this snapshot of the market, the evidence of a Bear market decline is rather substantial, and the technical evidence of a Bull market is rather thin. As the saying goes, keep it simple. Once again my time online will be severely limited for the next few weeks. Posts and email will be sporadic at best. Thank you for your understanding and patience. Thank you, Michael H. ($5/mo), for your marvelously generous subscription to this site -- I am greatly honored by your support and readership. Thank you, Alan B. ($5/mo), for your much-appreciated generous subscription to this site -- I am greatly honored by your support and readership.